“How do you two know each other?” This can be an awkward question especially if you’re a geek or you’re me, a geek that is occasionally ashamed of being a geek. I met most of my friends the traditional way, through school (I still have friends from second grade, one was the guy that was told “ok, you make sure Beth gets to the right class and to the right bus after school” on my first day here in Austin ), from college and from work. But there are still quite a few that were friends of friends that I mostly know because they sat across the table from me and were orc warriors, vampire truck drivers, robot agents and shapeshifted dragons. The best dice slingers in town. How do I know them? Well, it started in a tavern in my imagination. The rest came from online. I like to call them the Vegas Gang. There’s even one I knew in high school. We shared the same classes (for the most part), but our names rhymed which people would point out on occasion, one person referred to that as “cute” (yes, rhyming is adorable – if you like that, do I have a limerick for you) so I tried to not sit too close. I now know Seth better through the magic of the internet. So, if you ask me how I met them, this is how I truly know my current set of friends/acquaintances. I feel comfortable boldly stating this on my blog, because either you don’t know me (but you’re learning about me online) or you fit into one of the above categories and you’re accepting. But in real life (IRL if you prefer) when asked, I will fall back to what I feel is a more comfortable explanation “I met this person through friends” or “at a dinner party”. For a geek of my caliber, “dinner party” is code for “roleplaying session that began at noon, ended at 2am and heavy amounts of soda, chips and pizza were consumed (unless my friend Jeff was there, and he did the cooking throughout the day_ before we unraveled the devious plot, slayed the dragon, or arrived safely in the port of the space station after a harrowing encounter with some unknown force”. People don’t quite know what to do when you say either “online” or “playing GURPS” (which is “like” D&D in that it’s a roleplaying system). In my opinion, people are more comfortable with meeting someone “through friends” than hearing a long winded description of how “Lee was this awesome necromancer who…” Somehow, the term “roleplaying” (which I actually haven’t done in years, but it’s how I would have to honestly explain meeting some of my friends) thanks in part to the 1980’s movie by Tom Hanks, is the equivalent of saying “I eat babies” or “I’m a social misfit who worships Satan”. I’m here to assure you that the friends I met back in the day over a roleplaying table, while some may be categorized as a bit socially awkward, have yet to eat one baby or small toddler and don’t engage in anything cult like, to my knowledge. They even all hold down respectable jobs and can form whole sentences without too many physical twitches or ticks. Still, the average person won’t buy that. So, if you meet me on the street with a friend and you ask “how did you two meet”, I’ll still say “through friends”. You can envision a gardening or book club, while I can imagine an enchanted forest or haunted library. This entry was posted in Uncategorized and tagged Me, RPG. Oh, do I ever get this. I met The Boyfriend online. And over the years I’ve made several friends through blogging who have ended up a part of my “real life” and come to hang out with me at the family bar. The bloggers, to my “we met in the real world” friends, are part of my “writing group.” And for the longest time, The boyfriend and I met while seeing a band (which was how we actually met in person). Uhm…can I buy those dice? That’d be awesome. 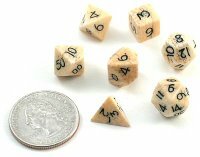 Sadly, I don’t remember where those came from, but I’ve seen a lot of decent bone dice for sale that look just as cool if not better.